BTS fans, you should know one long-awaited moment is about to go down. The rising k-pop group is hard at work on a future comeback, but one of its rappers is preparing an entirely different gift. After all, J-Hope has dedicated lots of time to his yet-released mixtape, and this should be the year it drops. You know, considering the rapper did just tease fans about its release online. Over on social media, fans of BTS began freaking out after J-Hope posted a sly message on the group’s fan cafe. On January 8, the idol posted the message, “It’s soon, real soon” with a ton of exclamation points and a music note. The sudden post got fans buzzing about the rapper’s mixtape, and fans are now preparing themselves for when the release will go live. Last year, J-Hope did speak openly about his desire to release his mixtape when he felt it was ready. The idol even wished he would be able to release it successfully during a group trip to Hawaii. RM went on to hype fans further during a recent livestream as he told fans he was very impressed and surprised by J-Hope’s work. 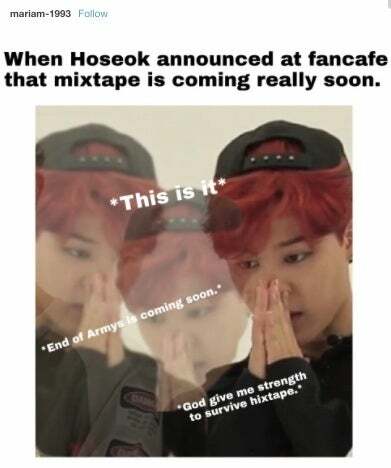 Right now, there is no word on when J-Hope will see his mixtape go live, but fans have a hunch. The actor will celebrate his birthday on February 18, and many think he will give fans a gift of his own on that day. So far, the only solo rap track J-Hope has released as of yet is “1 Verse”, and the single got lots praise online. So, you can expect the entire BTS fanbase to promptly lose it when J-Hope goes live with his full mixtape. Are you excited for J-Hope to drop his mixtape? Hit me up on Twitter @MeganPetersCB to let me know and talk all things comics, k-pop, and anime!